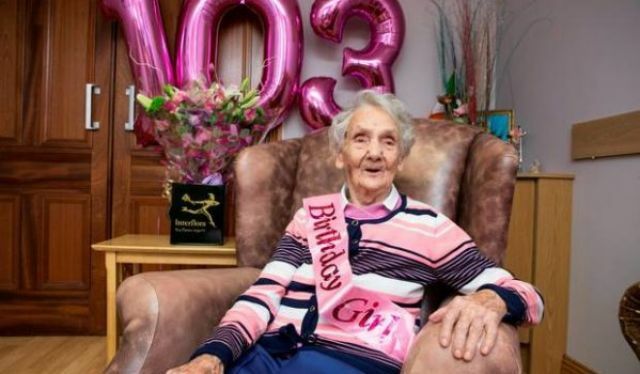 A Co Kildare woman who turned 103 today is an inspiration to her 77- year-old daughter who flew home from Australia to mark the birthday. May Morris, from Castledermot, Co Kildare, said lots of laughter and lots of prayer were her tips for reaching the road to longevity. The Kildare woman worked as a factory worker in England for 60 years, and was heavily involved in charity work for the missions and St Vincent de Paul there, before she returned to home soil again. May married twice. Her second husband was a sergeant for the British army based in India. May lived alone and independently until two years. Now she resides at Hillview Nursing Home in Co Carlow. "The best way to live in the world of God is to be right and be as nice as you can," May said, as she was surrounded by friends and staff.